Over the course of the Boston Marathon weekend and during the race on Monday, Globe videographer Taylor de Lench spent time documenting the journey of retired US Marine Jose Sanchez, who lost a leg in Afghanistan. Sanchez competed as part of Team Semper Fi, which exists to help service members who are dealing with life-changing injuries, post-traumatic stress or critical illness. Sanchez, who is from San Antonio, Texas, uses a “blade runner” style prosthetic, and completed the marathon in 5 hours, 33 minutes and 49 seconds. Watch his story in the video embedded at the top of this article. Additional footage by Emily Zendt. 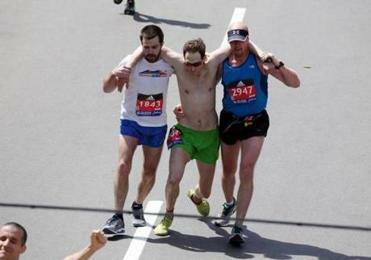 Ari Ofsevit spent the night in Tufts Medical Center’s ICU after two fellow runners helped him the finish the race.